Soft glow effects are a great way to enhance your photos, especially portrait shots, and creating them in Photoshop is easy. Yet the steps you take to create them can mean the difference between a static result (meaning one that can't easily be changed or edited later) and one that's much more flexible, where you can experiment and fine-tune the effect until you get it looking just right. Both ways of creating the soft glow effect can be completed very quickly, but which one you choose will depend a lot on your current skill level and how comfortable you are with Photoshop's more advanced features (like Smart Objects and Smart Filters). In this tutorial and the next, I'll show you both ways of doing things, beginning here with the static version that's best for beginners. In the next tutorial, we'll learn how to create the exact same effect but with much more control over the final result. Even if you're new to Photoshop, I encourage you to try out both ways of adding a soft glow to your images to get a feel for how powerful and flexible Photoshop can be once you go just a little bit beyond the basics. As always, I'll cover everything step-by-step so no matter what your skill level, you can easily follow along. If you want to jump straight into the more advanced version, check out the next tutorial in this series, Editable Soft Glow With Smart Filters In Photoshop. Otherwise, let's begin with the basics! The "Background copy" layer appears above the original Background layer. Double-clicking on the name "Background copy" to highlight it. The "Background copy" layer is now the "Soft Glow" layer. To create the actual soft glow effect, we'll first apply some blurring to the "Soft Glow" layer. Then we'll change the way the blurred layer mixes with the original image below it by changing its blend mode. This opens the Gaussian Blur dialog box, which lets us control the amount of blur being applied to the layer using the Radius slider along the bottom. The further you drag the slider to the right, the stronger the blur effect will appear. Photoshop gives us a live preview of the effect in the document, so keep an eye on your image as you drag the slider to judge the results. For a subtle glow, use smaller radius values. 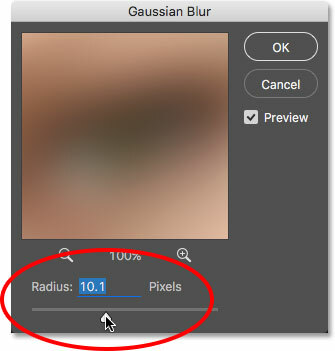 The blurring effect with a radius of 10 pixels. For a more dream-like glow, use a larger radius value. The blurring effect with a radius of 20 pixels. Changing the layer blend mode from Normal to Soft Light. The effect using the Soft Light blend mode. The result using the Overlay blend mode. To fine-tune the effect, simply lower the layer's opacity. You'll find the Opacity option in the upper right of the Layers panel, directly across from the Blend Mode option. The default opacity value is 100%. The more you lower it, the more the original photo below the "Soft Glow" layer will show through. In other words, we’ll see more of the original image and less of the blurred image. Lowering the opacity of the "Soft Glow" layer. And there we have it! That's the quick and easy way to add a soft glow effect to an image with Photoshop! But, now that I'm done, well, what if I don't really like the result? I went with a subtle glow, but what if a stronger, more "dreamy" glow would have worked better? How can I go back and change it? I mean, I can easily change the blend mode from Soft Light to Overlay (and vice versa), and I can try changing the layer's Opacity value, but that's not really what I want to do. I want to go back and adjust the amount of blurring I applied with the Gaussian Blur filter way back in Step 3. How do I do that? The short answer is, I can't, and that's where the problem with this way of creating the soft glow effect comes in. As soon as we clicked OK to close out of the Gaussian Blur filter, we committed the blur effect to the layer. In other words, we made a permanent change, or at least, one that can't easily be undone. A better way to work would be to keep the entire effect, including the Gaussian Blur filter, fully editable from start to finish. That way, even after the effect is completed, we could still go back and try different blur amounts to make sure we're getting the best result possible. So how do we do that? We do it by taking advantage of Photoshop's powerful Smart Objects and Smart Filters. They may sound intimidating, but they're actually very simple to use. In fact, they're every bit as easy to use as normal layers and filters in Photoshop, but they give us much more flexibility. In the next tutorial, we'll learn how to create this exact same soft glow effect while keeping every step completely editable. So if you're ready to take your Photoshop skills to the next level, head on over to the Editable Soft Glow With Smart Filters tutorial. See you there!